In addition, we accept purchase orders from major corporations, universities and government agencies in the United States and Canada. What do Adobe, Cisco, Matrox, Sun and many other hi-tech companies all have in common? Need help getting started writing an SDK? if you're on the right track? No budget for travel... no time for training? 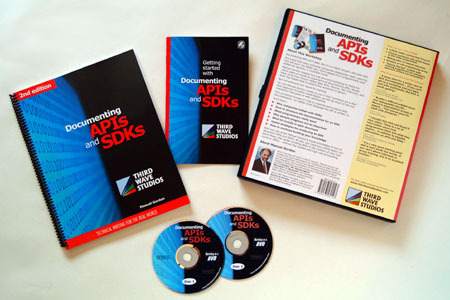 API writing guru Manuel Gordon comes to you on this double-DVD set that captures the entire content of his unique workshop on documenting APIs and SDKs. It's the next best thing to being there! Now you can work with developers with more confidence than ever to create truly useful SDK documentation. Stop cutting and pasting, and start writing—today! Now you (and your whole team) can share this inside knowledge and learn these vital career-building skills, without the high cost and hassles of travel. You don't have to know everything about Java to work on an API written in that language. You need to know just enough Java to decode source files and actually start writing, not just formatting the programmer's notes. 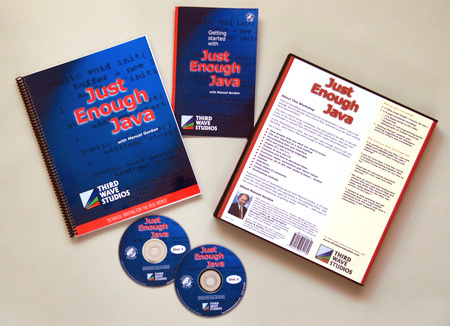 Now you can learn all you really need to know about Java to create useful documentation. This new "Workshop-on-a-DVD" (which also includes a workbook) captures all of the useful information and rich interaction from Manuel Gordon's unique live workshop on high-quality digital video... with none of the extra time and costs of getting there! It's the next best thing to being there... for a fraction of the price! $49.95 + $9 s&h Each workbook contains all the slides, exercises and background material distributed at Gordon & Gordon workshops. Entire contents © 2004-2016 by Marc Proulx except for portions which are © 1999-2016 by Manuel Gordon & Gordon Graham and are used with permission.